Looking towards a camp in Western Nuerland, with numerous cattle tethered amongst small huts. The hut in the foreground has mud-plastered walls and a small thatched top twisted into a finial. Note on print reverse ms pencil - "1 W.Nuer" & print front border ms ink - "NUER XIII/12"
Morton, Chris. 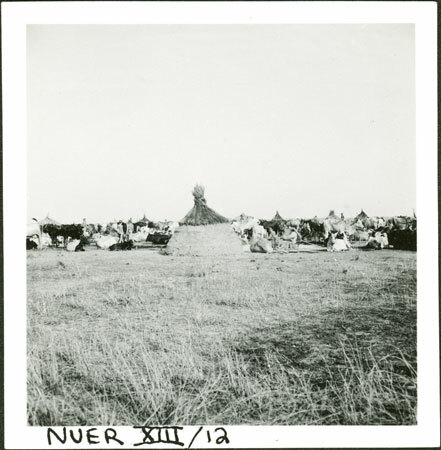 "Nuer cattle camp" Southern Sudan Project (in development). 03 Jan. 2006. Pitt Rivers Museum. <http://southernsudan.prm.ox.ac.uk/details/1998.355.606.2/>.